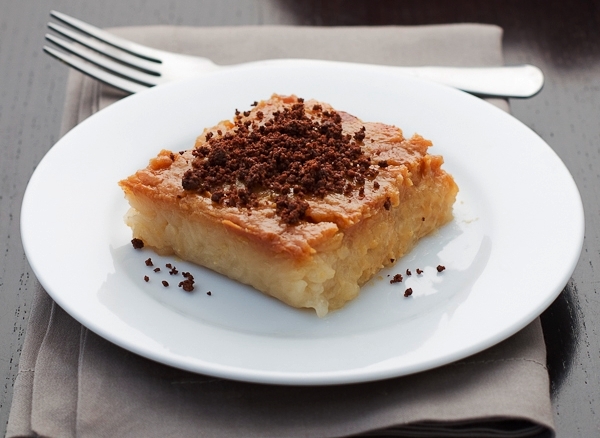 This century-old recipe of Biko has been a banquet and restaurant favorite among the Filipinos. The sweet taste of having to bite into something soft and sweet, just ultimate comfort food. Crunchy toasted coconut milk crumbs. Rich caramelized coconut milk. Sweet sticky rice. With every bite, You'll be drifted away into pure bliss. You need to use sweet rice or sticky rice (sometimes called glutinous rice) for this recipe. Coconut cream is found in most Asian and ethnic stores but if you can’t find it, just use the the thick cream from the top layer of a good quality can of coconut milk. 1. Grate and squeeze out milk from 2 coconuts. Save 3/4 cup of the first milk squeezed out (rich milk) for topping. 2. Dilute the rest of the coconut milk to make 3 1/2 cups. Or use 1 can (12 ounces) frozen coconut milk, saving 3/4 cup of the thick milk for topping and diluting the rest to make 3 1/2 cups. 3. Boil rice and coconut milk in a heavy pot stirring constantly to keep from burning (about 15 to 20 minutes). When the rice is done and almost dry, lower the heat and add the sugar and butter. 4. Mix well and set aside. 5. Scoop the cooked biko and place it in a baking dish or Bilao then flatten the surface. 6. To make latik or topping; combine all topping ingredients in a heavy saucepan and cook over low heat stirring constantly until thick (about 15 minutes) or brown. 7. then pour topping over rice mixture. served while hot.